The seventh installment in the Ys series, a fast paced action-packed RPG that lets the player fight enemies in real time with a team of three active characters. Ys Seven is the seventh numbered entry in the storied action RPG series developed by Nihon Falcom. The game follows Adol Christin and his group of fellow adventurers who travel through the land of Altago to learn more about the local gods: the Five Great Dragons. 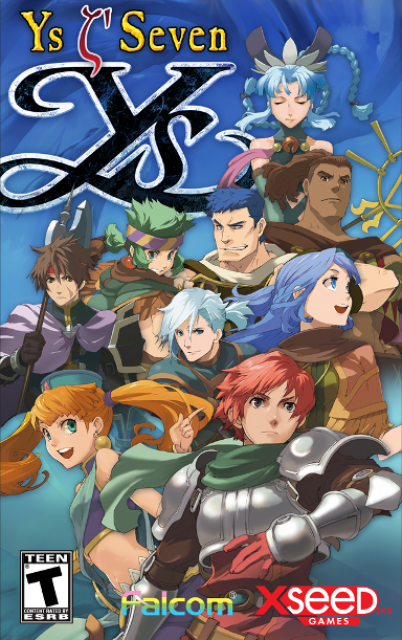 Falcom released Ys Seven on the PlayStation Portable in Japan on September 17, 2009 and was localized into English by XSEED in 2010. A PC port was also created by XSEED that was released years later on Steam and GOG on August 30, 2017. In battle the player controls one of the three active battle party members. The other two characters are controlled by AI and follow the controlled character on the map. During battle, the player can easily switch to one of the other two characters to perform a certain attack. There are 3 attack types: Slash, Strike and Pierce. Some enemies are more vulnerable to a certain attack type. Slash attacks are useful against plants and enemies with soft, fleshy bodies. There are no enemies invulnerable to slash attacks. Strike attacks are attacks of blunt force and are most effective against hard shell-like bodies. Strike attacks have a higher rate to stun opponents. Pierce attacks come from weapons like rapiers or arrows from bows. They are most effective against agile enemies such as birds and flying insects. Pierce attacks usually have a higher range than other attacks. Certain skills are associated with certain weapons and can initially only be used when that weapon is equipped. However, when a skill reaches level 1 or higher, by using it in battle, the skill will be permanently available even when the associated weapon is not equipped. Characters can learn multiple skills this way. Learned skills can be removed or added from the character. Each character has his/her own EXTRA attack. The EXTRA attack can be used when the EXTRA bar is filled up. This bar gets filled up when special attacks are used. There is a total of 9 playable characters in the game. The player moves on the map with a maximum of 3 active battle party members. The remaining characters are put on standby and can be swapped with active battle party members at any time. Characters on standby also gain experience during battles but not as much as the active battle party members. The player can quickly switch between controlling any of the 3 active battle party members. New items can be bought or sold at shops throughout the game. There is also an option to Synthesize gathered materials from defeated monsters or from Harvest Points which usually generates stronger items than are already available in the shop.